Post news Report RSS	Croctas -Learn more about the lore! Be careful when you’re walking in the woods, or you may find yourself face to face with a big bad croctas… But what are they exactly? Ladies and gentlemen, it’s time for a bit of lore. The Croctas family are enemies that can be found in the Crelk Forest, the plains of Herelsor, and in the Marsh of Alasea in their corroded form. Croctas have a mouth on their back, that they can use to mimic human speech and attract their victims in the wood. At first, young crocta cubs don’t have any vocabulary, and learn by watching their parents hunt. When a prey is hurt, croctas will play with them before eating them to “enrich their vocabulary” of their screams. The more new words a prey will use, the more competent the croctas will become at imitation. The older croctas can even began to understand the words they are mimicking and can learn to talk to humans. During courtship rituals, croctas will exchange their roster of words: “Help me, Please, Don’t kill me, Mama!...” Croctas with similar vocabulary will mate and have cubs. A hierarchy will be created in the pack depending on the variety of their vocabulary, the best hunters being the most literate. Human hunters chasing croctas may encounter those courtship rituals and be traumatised for life. 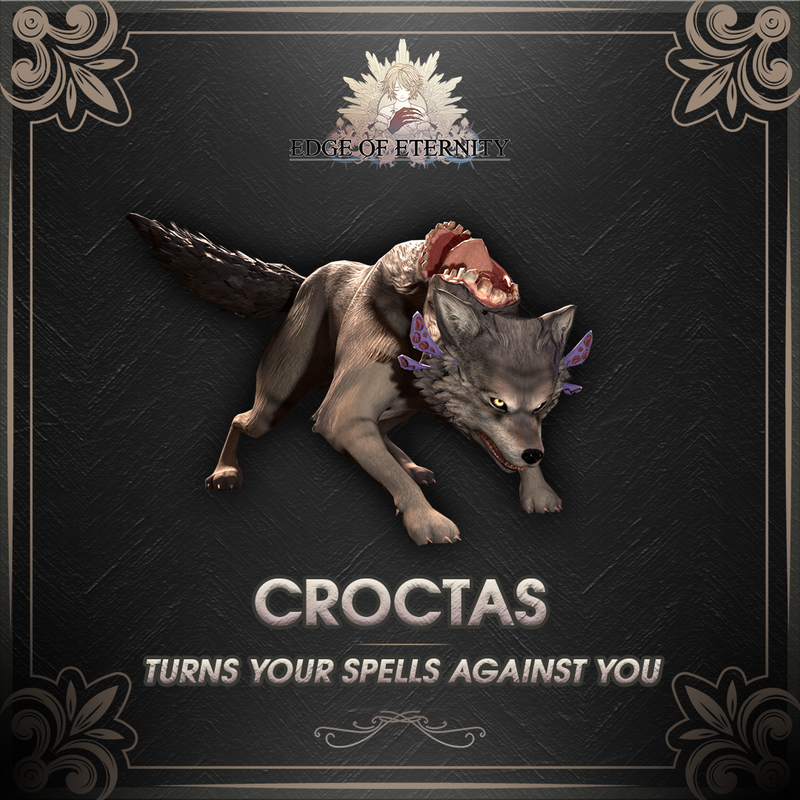 Croctas usually live in forests but may approach humans to hunt. Roughly fifty years ago, a huge hunt took place all over the continent and greatly reduced the numbers of croctas. As a result, a lot of knowledge about the specie was lost, and only hunters know the use of the mouth on a crocta back. Most of the population is unaware of its sinister purpose. On the other side, new generation of croctas need to relearn the use of human words. With the reduction in number came a reduction in knowledge, and a lot of know-how to mimic human died in the hunt. *Thunder litany, produce a small electric discharge on 1 to 3 nexus for a period of time.